Balraj Sahni Centenary – Harsh Thakor | कृति मेरे मन की……. 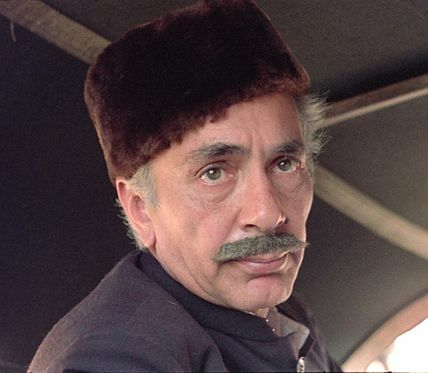 On May 1ST 2013 we celebrate the centenary of the legendary Indian actor Balraj Sahni.He was born in Rawalpindi,in Punjab on May 1st 1913.It is so appropriate that he was born on the historic occasion of May Day as he himself devoted his life to the liberation of the working class. What was unique about Balraj Sahni was the style in which he portrayed the oppressed masses of India.He was a thorn in the flesh to the ruling class culture.From his youth days he was influenced by Marxism and joined the Communist Party of India.Balraj was one of the founding members of the I.P.T.A.and was arrested in 1951 for supporting the Telengana Struggle.Balraj was the founding member of the All India youth federation-the youth wing of te Communist Party of India. In 1947 Balraj gave his first portrayal in Dharti ke Lal. Dharti Ke Lal was critically acclaimed for its scathing view of notorious Bengal famine of 1943 in which over 1.5 million people died. 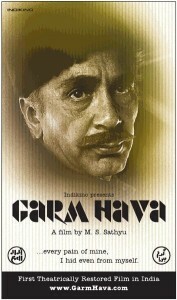 It is considered an important political film as it gives a realistic portrayal of the changing social and economic climate during the World War II.The film uses the plight of a single family caught in this famine, and tells the story of human devastation, and the loss of humanity during the struggle to survive.During the Bengal famine of 1943, members of IPTA travelled all over India, performing plays and collecting funds for the survivors of the famine, which has destroyed a whole generation of farmer families in Bengal. Thus Abbas was deeply influenced by the work of IPTA, and hence based his script upon two of IPTA plays, Nabanna (Harvest) and Jabanbandi by Bijon Bhattacharya, and the story Annadata by Krishan Chander. Even the cast of the film was mainly actors from IPTA. Hower it was in 1952 that he gave the best performance of his illustrious career in ‘Do Bhiga Zameen’.This film portrayed the poverty and landlordism prevalent in post-independence more than any film and it’s theme is arguably more relevant in the modern era of globlisation.Balraj brilliantly enacted the role of Shambu Mahato who becomes a rickshaw puller in Calcutta in order to pay his debts to the money lender and save his land .In the end a factory is put up on his plot.No face in Bolywood could express the sorrow of the peasant as Balraj Sahni acting as Shambu Mahato did when his land is lost.Sahni’s face literally wrote the hearts of millions of oppressed peasants of India not only then ,but even now.To get into the skin of the character Balraj pulled rickshaws and lived with the rickshaw pullers.Viewers could hardly feel Balraj was even acting as he was as natural as water flowing in a stream.He brilliantly exhibits feelings of hope and frustration as well as insecurity and confusion.It was one of the finest acting displays representing the opression of a common man in world cinema.Today in villages in India ,there are shortages of drinking water, suicides of peasants who are unable to pay their debts to commission agents,and forceful seizures of land by SEZ’s.Today in Balraj Sahni’s very homeland of Punjab there is still an abject monopoly of moneylenders. 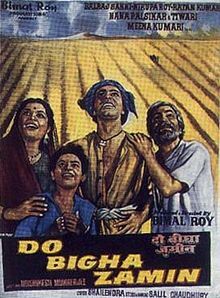 The story revolves around a farmer Shambu Mahato (Balraj Sahni), who lives with his wife Parvati `Paro’ (Nirupa Roy) and son Kanhaiya (Rattan Kumar) in a small village that has been hit badly by a famine. After years of drought, the region finally gets rain, leading to the farmers to rejoice. Shambu owns two bighas (a unit of land measurement where 3 bighas is 1 acre) of land, which is the only means of livelihood for the whole family. The local zamindar (landlord) Thakur Harnam Singh (Murad) partners with some city business men to construct a mill on his large parcel of land, which in return would profit them and bring prosperity to the village. The only problem is that in the middle of Harnam singh’s land lay Shambu’s meager two bighas of land. Harnam Singh is very confident that he could buy Shambu’s land. Shambu has borrowed money from Harnam Singh several times in the past and has not paid back his debt. Harnam Singh calls for Shambu and proposes Shambu to sell his land to him in exchange for his debt. Shambu disagrees to sell his only livelihood and Harnam Singh gets upset. Harnam Singh orders him to pay back his debt by the next day or risk auctioning his land. Shambu comes back home to discuss the issue with his father, and with the help of his son, they figure out that the debt amounts to 65 rupees. Shambu wants to save his land by all means and sells all his household items including his wife’s gold earrings. When Shambu meets Harman Singh’s accountant to pay back his debt of 65 rupees, he’s shocked to know that he actually owes 235 rupees. The accountant had forged the accounts and now refuses to consider the labor provided by Shambu’s father Gangu as portion of debt payoff. The case goes to court and Shambu being an illiterate, has a tough time explaining to the judge how the accountant forged the numbers and how he took accountant’s word of mouth and did not demand any receipt. Shambu loses the case, however the judge orders Shambu to pay back 235 rupees to Harnam Singh in three months. If Shambu is not able to pay back his debt, then his land would be auctioned off and the proceeds would go to pay off his debts. Shambu now struggles to get the money and he is unable to get a loan because he has no collaterals. One of his village friends gives him an idea to go to Calcutta (now Kolkata) and try to get a job to earn enough money to pay off his debt. Shambu likes this idea, but faces resistance from his wife as she’s pregnant and does not want to live away from him. Shambu persuades her that he’ll be gone for three months only and it would benefit his family and the new born baby. Kanhaiya wants to join his father too, but Shambu refuses and scolds him. On the train to Calcutta, Shambu finds Kanhaiya hiding and hitchhiking with him and after a brief confrontation agrees to take Kanhaiya with him. In Calcutta, Shambu and Kanhaiya face a harsh welcome. Nobody is willing to talk with them, let alone help them. Kanhaiya befriends a street side shoe shiner named Lalu `Ustad’ (Jagdeep). They hope for no prospective and even loose their last possessions while they are asleep on the street sides. Kanhaiya falls ill, and Shambu ends up renting a small room in the slums with the help of a tea vendor and the landlady’s adopted grandchild rani. In order to pay the rent, Shambu works a coolie. Shambu befriends an old rickshaw-puller (Nasir Hussain), who helps him to get a license as a rickshaw-puller. Kanhaiya tries to help his family by taking up shoe shining with the help of old rickshaw-puller and Lalu `Ustad’. Back in the village, Parvati and Gangu survive on eating water chestnuts picked up from the local river. She’s seeks help from Bahu (Meena Kumari) to write letters to Shambu and stay in touch. As the three months end date nears by, Shambu becomes aggressive about earning and saving more money. One day, a man asks Shambu to chase another rickshaw that is carrying his girlfriend. Shambu is insisted to pull the rickshaw very fast for more money. The rickshaw loses a wheel and Shambu meets with an accident. Looking at the condition of his father, Kanhaiya joins a pick pocketer in order to earn quick money. Shambu gets mad and beats Kanhaiya when he comes to know about his dirty earnings. Meanwhile, Parvati gets worried since she receives no letters or money from Shambu and the Zamindar’s accountant accuses Shambu that he has forgotten his family. She ends up working on a local construction site and gets devastated when she receives the news that Shambu has met with an accident. Finally, Parvati decides to visit Shambu in the city even though Gangu is on bed rest suffering of high fever. Parvati arrives in Calcutta, and is taken by a strange man, who claims he knows Shambu and will take her to him. He takes her to his shed and tries to steal and force her. She flees from him, but comes under a car. The crowd gathers around her and they call for a rickshaw to take her to the hospital. Shambu who was passing by offers a ride, and is shocked to see his injured wife. Meanwhile, Kanhaiya not able to withstand his father’s condition steals money from a lady and runs back to the slum. He comes to know about his mother’s condition and rushes to the hospital. He cries after seeing his injured mother and claims that God has punished them because he started stealing money. He rips the money into pieces. The doctors tell Shambu that he has to spend money on medicine and blood in order to save his wife. Poor Shambu has no choice but so spend all his earnings to save his wife. Back in the village the land is auctioned because Shambu fails to pay back the debt and Gangu develops a mental disorder. The land is now owned by Harman Singh and the mill construction has begun. Shambu and his family come back to the village only to see their land sold and a factory being constructed over it. He then tries to get a handful of dirt from his land, but is stopped and forced to throw away by a security guard. The film ends as Shambu and his family walks away from their land. In Kabuliwala ,he again meticulously prepared for the role living with the kabuliwalas.Although emotional he again portrayed the character to perfection . Abdur Rehman Khan (Balraj Sahni), a middle-aged dry fruit seller from Afghanistan, comes to Calcutta to hawk his merchandise and befriends a small Bengali girl called Mini (Sonu) who reminds him of his own daughter Amina back in Afghanistan. He puts up at a boarding house along with his countrymen. Since he is short of money he decides to sell his goods on credit for increasing his business. Later, when he goes to collect his money, one of his customers abuses him and in the fight that ensues Rehman warns that he will not tolerate abuse and stabs the man when he does not stop the abuse. In the court Rehman’s lawyer tries to obfuscate the facts but in his characteristic and simple fashion Rehman states the truth in a matter of fact way. The judge, pleased with Rehman’s honesty, gives him 10 years’ rigorous imprisonment instead of the death sentence. On the day of his release, he goes to meet Mini but discovers that she has grown up into a woman and is about to get married. Mini does not recognize Rehman, who realises that his own daughter must have forgotten him too. Mini’s father gives Rehman the money for travelling back to Afghanistan out of Mini’s wedding budget to which Mini agrees; she also sends a gift for Rehman’s daughter. The film ends with Rehman travelling back to his homeland. Balraj Sahni is Salim Mirza, a Muslim businessman who chooses to stay back in India even as his siblings and even his older son decided to leave for Pakistan. It is a decision that will have grave consequences. Being a minority in a fledgling that suddenly looked upon their own people with suspicion, Mirza’s younger son (Farooque Shaikh) is told, often to his face, that he should go ‘to his own country’. As the individual strands play out their own denouements, Balraj Sahni’s Mirza is the face of every Indian muslim of the time who made that same choice. Where Sahni drifted was that inspite of being morally so drawn to the left he showed great sympathies toward Nehru and Gandhi and stood by the C.P.I,during the great Debate,failing to demarcate from the revisionism of the then U.S.S.R..He also acted in ‘Haqeekat’ a film about the Indo-China in the 1962 war which virtually treated China as the villains or culprits and glorified India’s cause.He failed to unite with the leftist forces who opposed the Sino-Indian war,taking no concrete stand opposing India’s role in the war.Sahni never fully recognized the reactionary character of Indian ‘Independence’ and of Gandhi and Nehru. Neverthless his good outweighed his negative points by far.Today revolutionary cinema could learn a lot from Balraj Sahni’s techniques. Balraj combined both the Brechtian and the Stanislavakian methods of acting.His acting revealed great depths of sensitivity and emotion but also contained powerful elements of being detached from the actual character.No actor ever in the history of Bolywood could exhibit the oppression of the common man with such skill and natural acting style.Balraj Sahni is simply an icon for Marxist cultural workers.He literally wrote the character which he played.His art contained more realism than any Indian actor enacting the oppressed common man.Today although a flourishing industry Bolywood is selling itself to the imperialist culture and represents the lackeys of the Ruling classes and imperialists .Major stars basically represent the capitalist classes and imperialist culture.. It is significant that in this very day and age section still idolize his work and see it’s significance.Several critiques rate Balraj Sahni,amongst the 3 finest Indian Bolywood actors of all time.This is a tribute to the ideology of Marxism.-Leninism.Communist revolutionary ranks of today appreciate the work ofSahni.The late revolutionary playwright,Gursharan Singh compiled a series of works of Balraj Sahni and launched the Balraj Sahni Prakashan.Marxist-Leninist-Maoist ranks could imbibe many a lesson from Sahni’s even if he did not publicly uphold Maoism.Let us remember this legend like a spark lighting in our hearts .It is of significance that even the bourgeois media and writers acclaim ‘Do Bhiga Zameen ‘ amongst the 5 best Bolywood films of all time. (I am sure even Marx,Lenin and Mao would have greatly admired it) We should re-incarnate ‘Do Bhiga Zameen’,in the context of the modern era of globalization,with the onslaught of the S.E.Z’s .This new version would have to place more emphasis on the imperialist onslaught.